This is a sheltered walk from the Treaty Grounds at Waitangi, along the bush-clad banks of the Waitangi River to Haruru Falls. The track is suitable for families but can be slippery in places after heavy rain. The walk leaves on the opposite side of the road from the Treaty Grounds. There is ample parking for cars. At first the track follows the edge of the Waitangi Golf Course and walkers are asked to be considerate of golfers and keep an eye out for stray golf balls. The track then follows the river for most of its length, passing through some attractive native trees. A feature of the walk is the boardwalk section which provides an opportunity to pass through the interior of a mature mangrove forest, an area which is usually inaccessible. The mangrove is a remarkable tree because of its ability to live in salt water. The local variety is one of about ten varieties worldwide, all of which grow in swamps, mudflats and tidal estuaries. An informative panel beside the boardwalk explains the attributes which make this such an ideal plant for these difficult growing conditions. For example the seeds germinate when they are still on the tree so that, when they fall, they have a root system ready-developed to dig into the mud where they come to rest. And look for the pneumatophores, aerial 'breathing' roots, protruding from the ground. If you stop for a time at low tide you will see small crabs emerge from their holes in the mud to feed. At the slightest sound or movement, they instantly scuttle for cover. You may see water birds such as heron hunting for them along the water's edge. Listen for the sharp sounds of the snapping shrimp. This environment plays an important part in the food chain of the sea with many juvenile forms of sea creature growing to maturity here. As you near Haruru Falls, the river widens. From the track above the river you will see some attractive homes on the opposite bank. 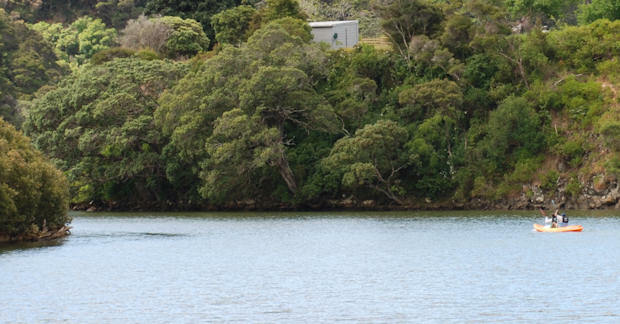 Watch for shags nesting and feeding their young high in the pohutukawa trees overhanging the river on your left. The trees are easy to spot because of the white bird droppings on their lower branches. Shag nests are untidy collections of twigs wedged into a fork of the tree. You may hear the young birds squawking noisily for food as the parents return to the nest. Shags feed on fish which is fed whole to older chicks and partly digested to the very young. Baby birds often reach deep into their parent's gullet to receive the regurgitated food. These birds can often be seen diving for food in the river and can swim considerable distances under water by propelling themselves with their webbed feet. Strangely, for birds that spend so much time in the water, their feathers are not waterproof and they can often be seen with wings outstretched to dry after fishing expeditions. You may also see kingfishers diving for food along the track. 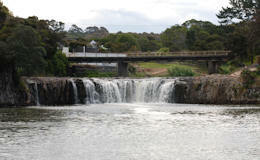 As you approach the end of the walk you will hear the thundering roar of Haruru Falls. The name, Haruru, means something like big noise and it is easy to understand the reason after heavy rain when the falls stretch from bank to bank. In summer though, you can often walk on the rocks above the falls and kayakers approach right up to their base. The wide basin below the falls has an interesting history as it was New Zealand's first river port and an important transport junction in the early days of European settlement (see history pages Haruru Falls). Today it is a popular holiday spot with resort hotels and holiday parks around its perimeter. You may like to refresh yourself after your walk with a drink or a meal at the Twin Pines Pub or walk up the hill to the local dairy and fish and chip shop in Yorke Road. From here, you can take a taxi back to Paihia or walk back along the road. Care should be taken here as this is a busy road and there are no footpaths. One attractive alternative is to arrange ahead of time to kayak the river in one direction and walk the other. The kayak hire company on the beach near the Waitangi River bridge can arrange this for you.